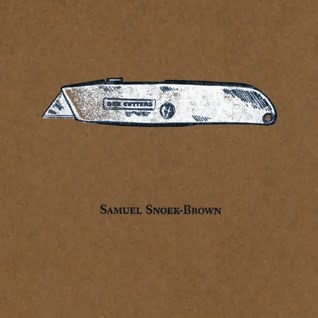 The stories in Box Cutters, Samuel Snoek-Brown’s flash fiction collection, operate on the principle that what’s included suggests what’s left out, with certain pieces resonating so profoundly that you can’t catch your breath. He makes minutely precise language choices that evoke specific states of mind, whole lives lived, and whole worlds spinning in only a few words. Throughout the book, sharply rendered moments show us various characters responding idiosyncratically to feelings of powerlessness. We also see characters frustrated by their lack of power in the collection’s strongest story, titled “The Voice You Throw, The Blow You Catch.” Here bar regulars watch as new patrons approach the watering hole’s resident eccentric, a curvy woman named LoAnn who obsessively works a ventriloquist dummy. The population of male regulars is comprised of failed suitors now enthralled by the spectacle of further futile attempts to pick up LoAnn and her dummy. Both LoAnn’s and her watchers’ quirks are on full display. Despite the brevity, you feel that you’ve come a distance with these characters, that you’re also fixedly watching as another poor sucker tries his hand at bedding LoAnn. When LoAnn mysteriously quits coming to the bar, you’re left feeling just like the regulars, that you’d witnessed something magical and have no means to bring it back.